"I Have a Dream" is the popular name given to the historic public speech by Martin Luther King, Jr., when he spoke of his desire for a future where blacks and whites among others would coexist harmoniously as equals. Today, as we celebrate Martin Luther King Day, Joey is reminded of this dream, and his desire as a piebald dachshund to be accepted as a breed standard by the American Kennel Club. Joey wants to know: What's not right about white? By no means is this slightly tongue-in-cheek post intended to, in any way, belittle the struggle that African Americans have dealt with in this country. But certainly, some parallels can be drawn upon in the simplest concepts of 'black' and 'white.' Dachshunds are probably the most diverse breed of dogs, and the AKC accepts all combinations of sizes, colors, patterns, and coat types except white. 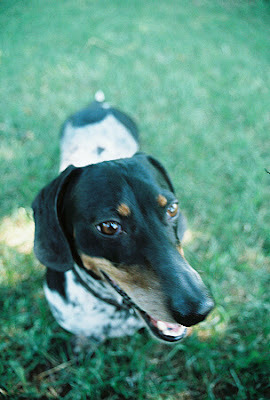 According to archaeologist, historian, and dachshund lover Iris Love, the piebald dachshund may very well be the progenitor of the dachshund that we know and love today. The piebald dachshund can clearly be seen in photographs and images spanning over the last 100 years, and very possibly, according to Mrs. Love, the ancient Egyptian times. And talk about a controversial topic. We're reminded of a breeder's response about white on dachshunds in the film Wiener Takes All: "Ask me next year" is all he said. When the filmmaker returned a year later to ask him again, his reply was again "Ask me next year." Clearly, this topic has divided the dachshund community. Joey says: "It's time to come together." Find out more about the piebald's struggle at Save the Piebalds. 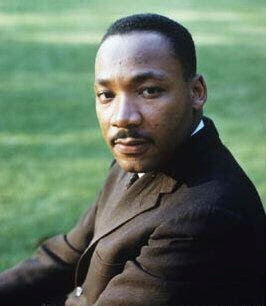 Enjoy your MLK day, and find out more about Martin Luther King, Jr. at wikipedia.